Is WordPress moving very fast? Matt Mullenweg addresses this concern. Home / General / Is WordPress moving very fast? Matt Mullenweg addresses this concern. As the pace of WordPress releases grows, developers of themes and plugins have to constantly keep on updating their products. This creates a real and increasing problem among the owners of WordPress site and specific companies who are into updating and maintaining the websites. This kind of pace of updates leads to almost daily need to fix problems. Plugin updates tend to break things even though we use professional, paid plugins for the idea of support and better quality products. I am aware of the fact that it’s really important to patch the issues of security, but we can also see huge number of new functionalities, moving plugins into core and different changes. Theme developers have to push out the updates with high frequencies and as a result they make several mistakes. Today’s larger ecosystem has been driven towards the failure by this pace of core updates. I am worried about this. While attempting to keep things patched, there arises new conflicts and then suddenly things break down. Hence at the end everyone related to the maintenance of the sites have to face continues flow of updates, which needs thorough testing. The Co-founder of WordPress Open Source Software project, Matt Mullenweg addresses this issue in 2015 State of the World at WordCamp US. Mika Epstein who approves and reviews plugins for the WordPress plugin directory shared the concerns of the developers who struggle to keep up with this pace. 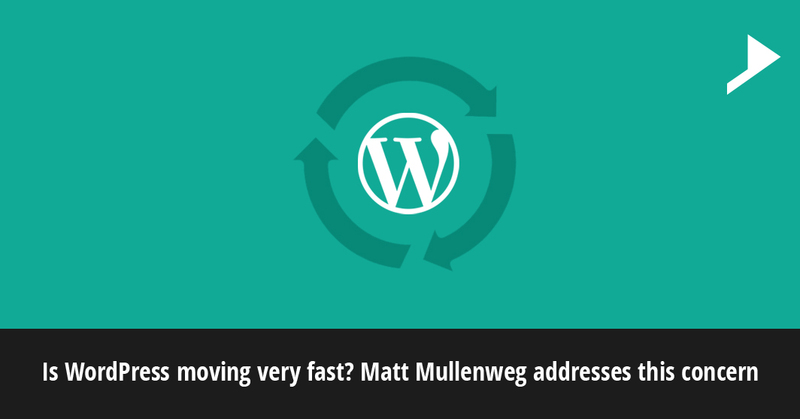 Mullenweg was asked by Epstein whether WordPress is moving too fast and is there a need to decrease the number of release per year one by one. The reply given by Mullenweg was really impressive. He said WordPress is not moving too fast. We need to find different types of strategies to meet the concerns of the site owners and the maintainers. Improvements can be carried out in the plugin directory which will help to share the burden in the testing process. He also added that the speed of the WordPress development will definitely increase, it will not at all decrease. The development team will continue to release three major versions every year. How to keep up with WordPress? While keeping developers and users informed themes and plugin authors have to subscribe to the Make Themes and Make Plugins sites respectively. A person involved in maintenance of the WordPress sites should subscribe to the Make Core site where information related to the core is published. So from all this one thing can be concluded that is, there will not be a change in the release strategy of the WordPress. If you are a developer or a person in charge of maintaining sites, how are you keeping up with WordPress? 11 years of treasured technical experience in Information Technology Space in different areas including VOIP SIP protocol, web application, development, e-commerce platform, cryptocurrency mining etc. Love writing and that’s what I do in my spare time.